Does it get any better? 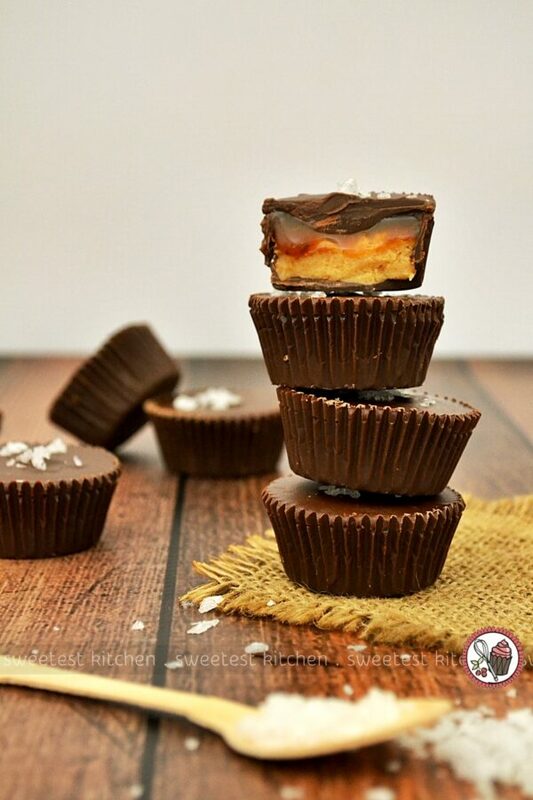 This is one of my ultimate flavor combinations, and I just love when I make a batch of chocolate peanut butter cups. One of the best things is that no one else in my family likes peanut butter (although, admittedly, one of them is allergic to peanuts), so I always get every single chocolate peanut butter cup to myself. When I had some leftover salted bourbon caramel from those pumpkin cupcakes I made a little while ago, a few ideas kept floating through my mind as to what do with it. 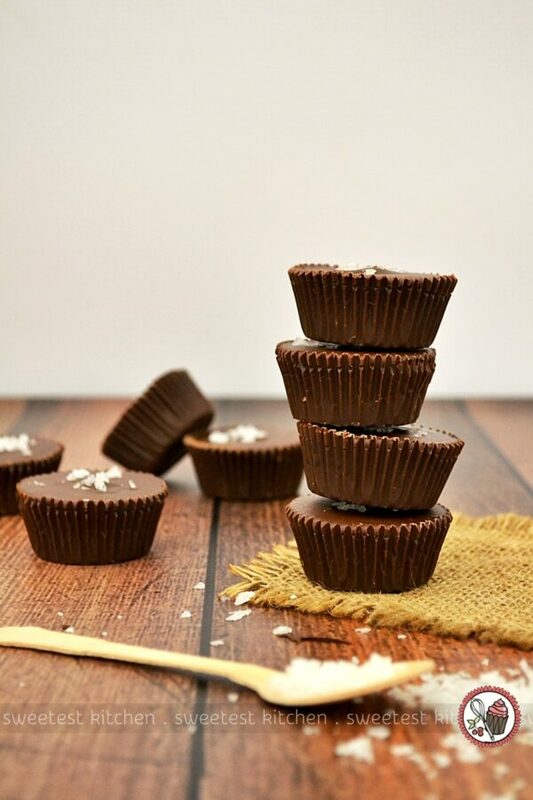 One of the ideas that stood out the most was chocolate peanut butter cups with a layer of the salted bourbon caramel and a small pinch of sea salt flakes sprinkled on top. Yep. Just when you thought chocolate and peanut butter couldn’t get any better, I go and add a bit of salt, a bit of caramel and a bit of booze. 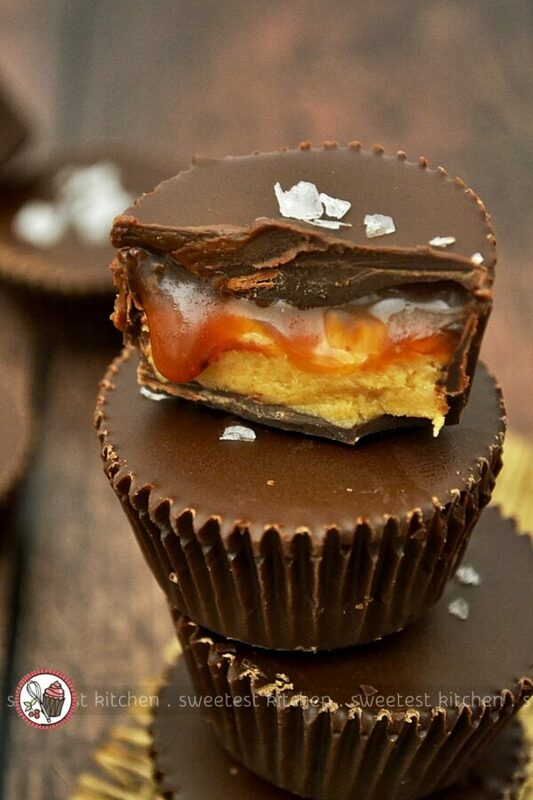 These chocolate peanut butter cups with salted bourbon caramel are all kinds of amazing. All. Kinds. I actually can’t even describe them very well because they leave me speechless. Which might explain why I’ve been trying to write this post for two days. The picture kind of speaks for itself, anyway, right? People are shoving all sorts of things inside chocolate cups these days, but I have to say that these are some of the best chocolate cups around. 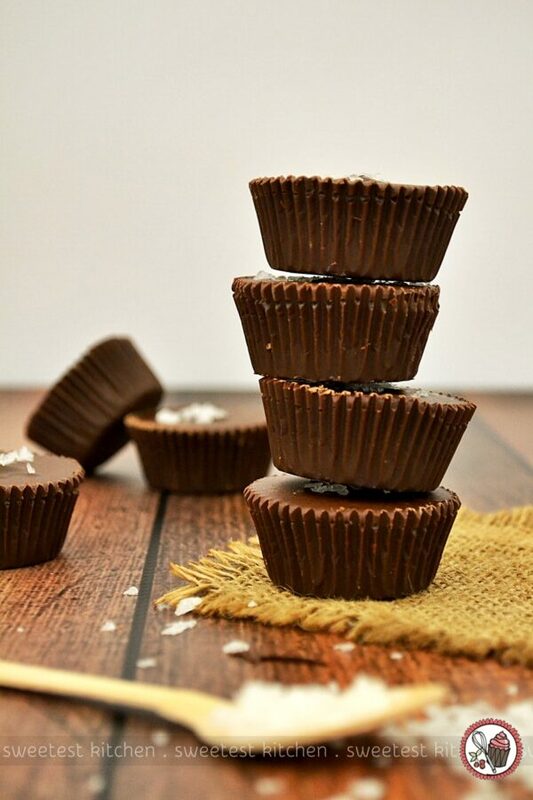 The layer of salted bourbon caramel makes these chocolate peanut butter cups sky-rocket to the next level! Totally out of this world! For the caramel: Place the sugar and water in a small, but deep, saucepan, stir gently, and bring to a simmer over medium heat. Do not stir anymore, but you can give the pan a gentle swirl or two. Cook for about 15 minutes, or until the mixture turns a sort of medium amber color. Brush the sides of the pan often with a wet pastry during cooking brush to prevent crystals from forming. Working quickly, reduce the heat to medium-low and carefully pour in the room temperature-thickend cream. It should bubble up, so be careful you don't get burnt or that it doesn't overflow the pan. Whisk the caramel until smooth. Carefully add the butter, vanilla, sea salt and bourbon (I might have *sort of* accidentally added a bit more bourbon!) and whisk until the butter has melted and the ingredients are combined. Set aside to thicken and cool completely before adding to the chocolate cups. For the peanut butter: Mix all the ingredients for the peanut butter layer together until completely combined. Set aside. Assembly: Melt the chopped chocolate in a heatproof bowl set over a pan of simmering water (the bowl should not touch the water). Stir occasionally until completely melted and smooth. Be sure no water gets into the chocolate. Meanwhile, line a mini cupcake pan with mini cupcake wrappers (you should get around 20 cups). 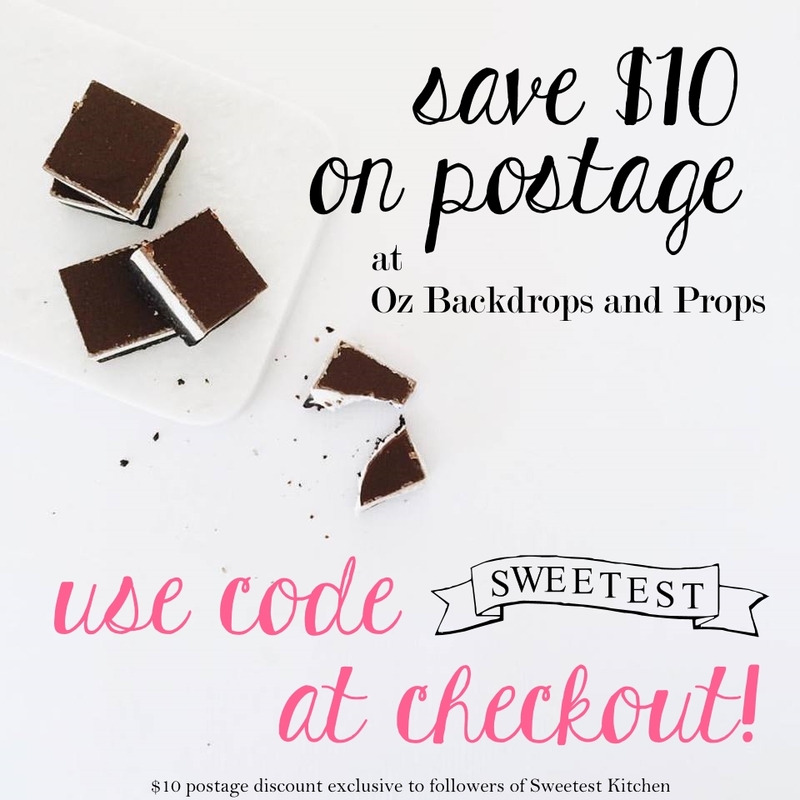 Pour 1 - 1½ teaspoons of melted chocolate into 4 cups at a time (not all the wrappers at the same time, though, or the chocolate might start to set before you get through coating the wrappers). Using the back of a small spoon, spread the chocolate around the bottom of the cups and completely up the sides. You may need to add more chocolate if you can still see bits of the wrapper through the chocolate. Repeat until all the wrappers are coated. Place the entire cupcake pan into the freezer for 5-10 minutes. Remove the pan from the freezer. Scoop out a slightly rounded teaspoon of the peanut butter mixture and roll it into a ball. Place the ball into one of the chocolate cups and gently smoosh it into the bottom, ensuring that there are no gaps between the peanut butter and the chocolate. The peanut butter layer should come about halfway up. Repeat for the rest of the cups. Next, place one teaspoon of the (completely cooled) caramel on top of the peanut butter. If the caramel is a bit thick, use a small spoon to help spread it across the top of the peanut butter layer. You should still have a bit of room at the top of the caramel to add the final chocolate layer. Place the cupcake pan in the freezer for 5-10 minutes to firm up the caramel (if it's too runny, it'll be too difficult to spread the melted chocolate on top). Meanwhile, if the melted chocolate has started to harden, remelt it over the pan of simmering water. Remove the cupcake pan from the freezer. The caramel should be firm now; if not, freeze for a bit longer. Working with one cup at a time, pour about a teaspoon of the melted chocolate on top of the caramel layer. Spread the chocolate across the top of the caramel with a small spoon until it is completely covered. If the chocolate doesn't reach the top of the paper wrapper, add a little bit more chocolate so it is even with the top of the wrapper. Repeat for the rest of the cups, working with just one cup at a time (if you add all the chocolate to the tops at once, the chocolate will start to set and you won't be able to spread it across the caramel). Place the cupcake pan in the freezer for about 2 minutes. The chocolate should still be wet, but firm enough to sprinkle the sea salt on top without the salt sinking. 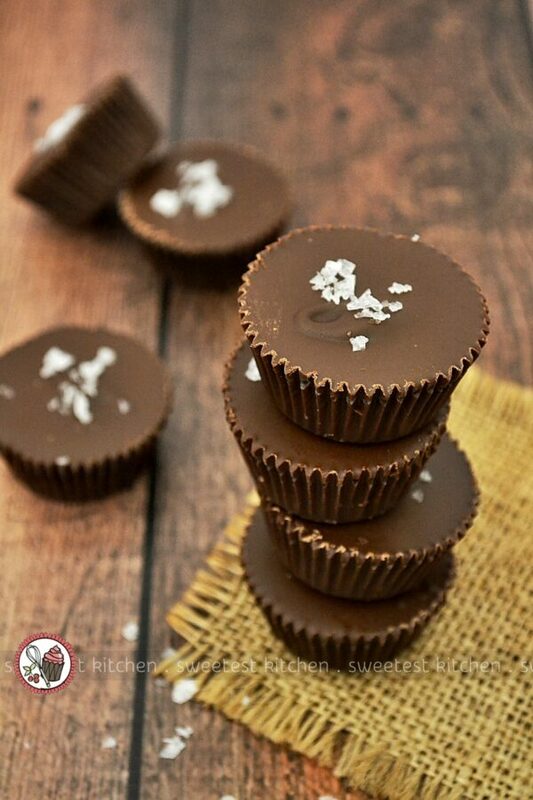 Sprinkle a small pinch of the sea salt flakes in the middle of the cups (you can slightly poke the flakes into the chocolate to ensure that they stick). Place the pan back in the freezer until the chocolate has completely set, about 20-30 minutes. Can be stored in an airtight container in the refrigerator for about one week. They are best enjoyed either straight from the refrigerator, or at room temperature. I used natural peanut butter for this recipe, which I prefer and recommended for a full-on peanut butter flavor. Totally sorry for the odd measurements for the peanut butter layer; I divided the original recipe into fourths so that I wouldn't have tons of leftover peanut butter filling. Holy moly! What an amazing idea – those three ingredients are literally some of my favorite foods to put into my face, it never occurred to me to put them all together. Can’t wait to try out this recipe! This is a blog that made me wonder.Thank you so much for sharing these are delicious I made it for my family !! Continue sharing.